The palace-city of Madina al-Zahra in Spain was built in 936 CE under the Caliph ‘Abd al-Rahman III in a hillside at the base of the Sierra Morena. This location, some distance from Cordoba in a lush and well-watered landscape, lends to the complex being functionally more diverse and self-sufficient than its predecessors. Though excavations at the site began in 1910, still only about 10 percent has been properly explored. It is a significant site as one of few royal palace-cities that were not built over in later years (Ruggles 2002 pp. 53). Contemporary and later sources are detailed and extensive in their documentation of the founding and construction of the palace-city, though these are not always commensurate with the archaeological record, possibly due to its being incomplete. Though perhaps an exaggeration, historical records state impressively that Madina al-Zahra is the product of work by ten thousand slaves and paid laborers working on a daily basis, in addition to skilled artisans from as far as Baghdad and Constantinople. Written sources draw particular attention to ‘Abd al-Rahman’s involvement in the building of the complex. Ruggles (2002) highlights this emphasis on “king as builder” as unusual, serving particularly to “express dynastic authority and personal power.” This is in keeping with the sense Madina al-Zahra was intended as a statement of Umayyad power, built when ‘Abn al-Rahman III was establishing legitimacy in the peninsula and entering into conflict with the Fatimid dynasty for control of North Africa. Staggeringly, a reported one third of the kingdom’s revenues were devoted to building and maintaining the palace-city. Medina al-Zahra is named as both a city (madina) and palace (qasr) in Arab texts, allowing us to understand this multi-faceted site as having both an urban and a bucolic character. (Ruggles 2002 pp. 53) The style of the palace-city is significant in its role in the development of a distinctly Andalusian Islamic architecture. Muslim names of stone carvers can be found in inscriptions, though the style of their work is a clear adaptation of Byzantine practices. (Ruggles 2002 pp. 60) Its layout (Figure 1) springs from the distinctly Cordoban tradition of building suburban villas or munyas, with several innovations. While the arrangement of rooms around a central courtyard is present in other instances in western Islamic architecture, basilical reception halls are seen for the first time at this complex, in contrast to domed halls in the eastern regions. Historians view the destruction of the Madina al-Zahra as a sign of the downfall of the Umayyad caliphate in al-Andalus and decline of Muslim rule in the Iberian Peninsula. 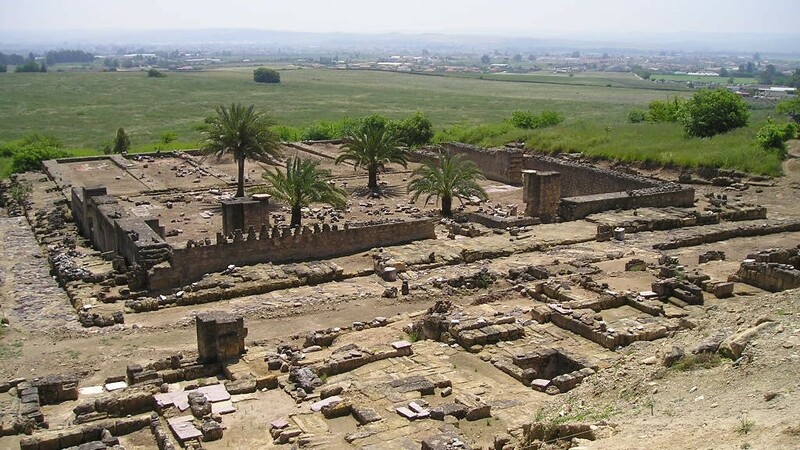 The palace-city was sacked by Berber troops in the 11th century after the fall of the caliphate, resulting from constant struggles for leadership and the growing strength of Christian armies. Ruggles, D. Fairchild. Gardens, landscape, and vision in the palaces of Islamic Spain. Penn State Press, 2002. Ruggles, D. Fairchild. “Madinat Al-Zahra and the Umayyad Palace” in Menocal, María Rosa, Raymond P. Scheindlin, and Michael Sells, eds. The Literature of Al-Andalus. Cambridge University Press, 2006.